Sensei Moon, or City Aikido in San Francisco has some really neat ideas on implementing ukemiwaza as a way to improve nagewaza. I once read some feedback on our style which said that generally ukes were considered to be somewhat stiff, or a little too floppy ~ with no inherent interest in countering. Assuming you agree, and I am uncertain if I do or not, but assuming that the critique was accurate, perhaps incorporating this type of training over the long term can begin to address this issue. Taking Uke’s balance is the key to avoid being countered.... 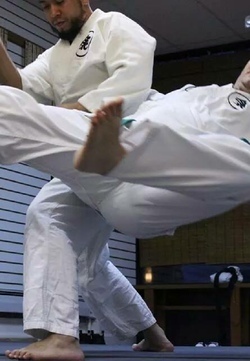 If uke is “more here than you are here” or is able to remain in a relatively balanced position during your technique, a counter is more likely. This type of material should be approached gently, and cooperatively.